Road to the Past | On The Road with Ms. M.
I’m a huge fan of medieval murder mysteries. I’ve read all the Brother Cadfael series, all the published paperbacks by Michael Jecks which begin with The Last Templar, Umberto Eco, The Name of the Rose and, as you know if you read an earlier blog page, I’ve started reading Karen Mosse’s books which straddle the present and the past. 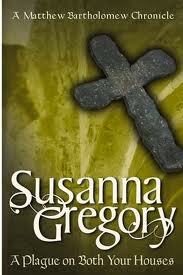 I’ve just finished a book by an author who is new to me, Susanna Gregory. 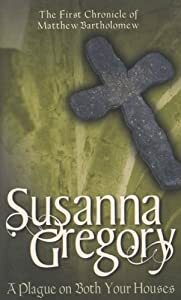 No relation to Phillipa Gregory as Susanna is a pseudonym of Elizabeth Cruwys, a Cambridge academic who was previously a coroner’s officer. I’ve begun with the first in her Brother Matthew series, A Plague on Both Your Houses. I enjoyed it very much. Towards the end, when Brother Matthew is whiling his time away in an extremely dark and damp dungeon trying to sort through all his information and organize his thoughts to find out who’s been killing off monks, scholars, and deans of colleges and universities, I found it a bit tedious and skipped ahead a bit to get on with the action. Aside from that, it was a most enjoyable and enlightening read. Her coroner’s background comes through with details that an author with fewer credentials in this area might overlook. And even though I’ve read many books that take place in medieval monasteries, universities, times of the plague, etc., this book gave it all a different perspective. Brother Matthew Bartholomew is a doctor with different ideas about preventing disease. Ahead of his time. He believes in cleanliness, does not believe in leeches, and will not prescribe unnecessary treatments nor read astrological charts to line his own pockets. Susanna has written more than 40 mysteries and co-authors mysteries with Beau Riffenburgh under the pseudonym Simon Beaufort. I will definitely read more books by her after I’ve read one or two more by Karen Mosse that are waiting on my nightstand. Perhaps I’ll take Simon Beaufort with me on the road!